This October, Columbia University Press will publish Conflict, Conquest, and Conversion: Two Thousand Years of Christian Missions in the Middle East by Eleanor H. Tejirian (Columbia University) and Reeva Spector Simon (Columbia University). The publisher’s description follows. Conflict, Conquest, and Conversion describes two thousand years of the Christian missionary enterprise in the Middle East within the context of the region’s political evolution. 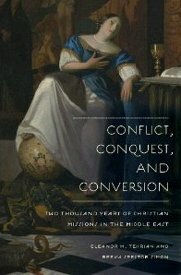 Its broad, rich narrative follows Christian missions as they interact with imperial powers and as the momentum of religious change shifts from Christianity to Islam and back, adding new dimensions to the history of the region and the nature of the relationship between the Middle East and the West. Historians and political scientists increasingly recognize the importance of integrating religion into political analysis, and this volume, using long-neglected sources, provides the necessary context for this effort. It surveys Christian missions from the earliest days of Christianity to the present, with particular emphasis on the role of Christian missions, both Protestant and Catholic, in the political and economic imperialism of the nineteenth and twentieth centuries. The authors delineate the ongoing tensions between conversion and a focus on witness and “good works” within the missionary movement, which has contributed to the development and spread of nongovernmental organizations. This volume’s systematic study offers an unparalleled encounter with the social, political, and economic consequences of these trends.